Can someone let me know how I know if I have the correct springs for the cowl induction hood of my 1970 LS6? Do your springs have 29 coils? That is how you will know. You want 29 coils. I'll jump in here. Has anyone recently bought a set of springs that work well and have a part number and brand? My new hinges came with 26 coils. Not strong enough. I've never counted the coils. We bought the 70 Malibu conv in 1998, and I promptly added a complete CI hood system. Removed the stock flat hood, bolted on the CI hood and all is great. It stays up fine with the springs that were on the stock, flat hood. 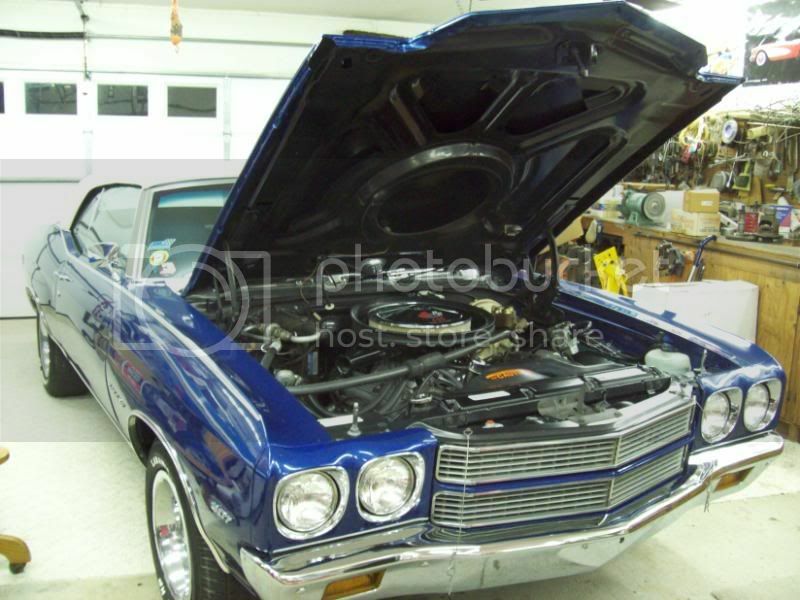 We bought the 70 Malibu conv in 1998, and I promptly added a complete CI hood system. Removed the stock flat hood, bolted on the CI hood and all is great. It stays up fine with the springs that were on the stock, flat hood. That been my experience too, multiples of times, both with domed hoods and CI hoods, all the way back to the '70s. GM Part number 03848272, 29 coil count hood spring. My experience is GM is better than any reproduction hood spring you can buy. Thanks Willie. I'll give those a try. Agree with the above about swapping SS hoods and never changing the springs. Done it many times going back to the mid 80's. But the car I'm working on now has been apart for nearly 20 years and I don't have any factory hinges or springs in stock. Keep those reproduction hood hinges well lubricated, as I am not a big fan of them. Got the new GM springs today (sticky oil on them) holds the hood up nicely. So I agree just buy the ones from GM. They work. Thanks. I FINALLY remembered to go out and count the coils on my springs ---- 26. When I bought the car in 98, it had the stock flat hood, and I'm sure the springs are what were installed on the car at the Baltimore plant. NEVER an issue with my CI hood staying up.